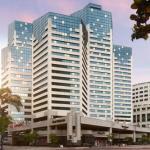 Wyndham Hotel is centrally located in downtown San Diego. Many points of interest in downtown San Diego were within walking distance. The staff are courteous and very helpful. The room and the hotel is clean. Great architecture and the hotel lobby is impressive. The hotel amenities, staff were courteous. The valet parking was a little slow in checking in and retrieving cars. Hotel would have been a perfect 4 star. The room/bathroom/bedding all very nice. Perhaps 3 star rating due to poor customer service? After waiting for shuttle at airport for one hour and calling twice ended up taking a cab to hotel. Front desk clerk argumentative before finally reimbursing me. Was unable to take shuttle to airport in morning as first one does not leave hotel until 6 am. My flight leaving at 6:20 am. Room/bathroom exceeded 3 star rating. Wanted a hotel near the Gas lamp district so we could go to a Padres game and good restaurants. Staff very friendly, room comfortable nice work out room and pool area. Comfortable room, quiet and great work out room and pool area. Grout in shower needed cleaning. My family and I have stayed at The Wyndham San Diego at Emerald Plaza and it is truly a jewel in the heart of Downtown San Diego. Inside you'll find friendly, professional staff and well appointed rooms with pillow top mattresses and beautiful bay views. For the business traveler, you will find that the Wyndham has spared no detail, providing high speed Internet access, cordless dual phones, over-sized desks and Herman Miller office chairs in each room. The "Jewel" is located between the bay and the vibrant Gaslamp Quarter. At the historic Gaslamp, you will find trendy shops, swanky nightclubs and a variety of restaurants to satisfy even the most discriminating pallet. Family fun is well within your reach! Catch a ball game at Petco Baseball Park, or perhaps youd rather take the kids to Sea World and the world famous San Diego Zoo and make a day of it. Balboa Park, whale watching, the beaches, The IMAX Theatre and more are all within a 10-minute car ride from the hotel. For the Fitness Enthusiast, Wyndham has a lot to offer: A fully furnished gym with high-end Life Fitness Treadmills, Cross Trainers, and Life Steppers; Core Boards, Physio-balls and strength training machines. For those of you who love the outdoors, heaven is only 2 blocks away. At the bay you can have your fill of over 4 miles of scenic boardwalk for walking, running, people watching, outdoor boot camp sessions and more! Each of the 436 rooms offers the following: Air Conditioning, Bathroom Amenities, Bathroom Phone, Private Bath, Cable Television, Coffee/Tea, Cordless Phone, Hair Dryer, Iron/Ironing Board, Mini Bar, Movies, Radio AM/FM, Mini Refrigerator, Self-controlled Heating System, Speaker Phone and WebTV. The hotel has one restaurant that serves buffet style and per table service. The hotel also offers meeting rooms, banquet halls for special events, computers if you need to stay in touch, a state of the art fitness center and a roof top pool. Yes! I would recommend this hotel to your friends, family and business associates. Parking: Yes, there is parking. Valet parking is $25/per night.